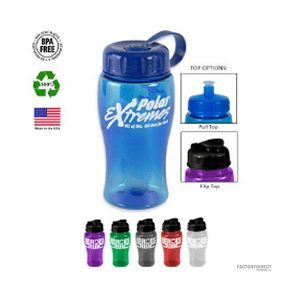 Increase your brand awareness while you decrease your environmental impact with wholesale water bottles constructed from recycled plastic. Our 28 oz. transparent water bottle is a smart choice because each time your customers use the bottle whether at work or the gym or just going for a walk in their neighborhood they will showcase your logo. This mobile advertising keeps your brand active and also makes clear that sustainability and environmental responsibility are near and dear issues for your company. Check out our overseas production for more customization options at great wholesale pricing.